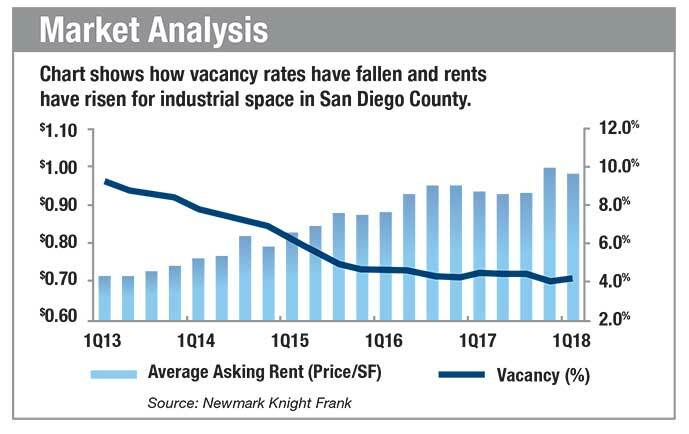 San Diego  Mirroring what’s happening in the market for office space in San Diego County, demand for industrial space in the region is outstripping supply, driving rents to levels not seen since before the Great Recession and vacancy rates to near or at record lows. Reports out this month for the first quarter of 2018 from Newmark Knight Frank, Kidder Mathews, Cushman & Wakefield, CBRE and Ten-X Commercial, among others, confirm the same trend and predict it’s likely to continue throughout the year. “The vacancy rates in the core markets are almost down to zero — one to 3 percent in areas like Kearny Mesa, Miramar, Poway, and places like that,” said Bob Willingham, senior vice president of Kidder Mathews. “San Diego is an appealing market for industrial property for investors, thanks to its judicious supply pipeline and healthy demand, which have brought vacancies to a 20-year low,” Ten-X Commercial said in its first quarter review of San Diego County’s industrial market. “Year-over-year rent growth has neared the 5 percent mark in recent years and rents are projected to reach all-time highs this year,” according to Ten-X Commercial.